Today I have some time by myself to listen to jazz. These are rare moments when I'm all alone, so I'm enjoying it to the full. I decided to put on Hank Mobley's "Hank" on Blue Note 1560. I haven't listened to this album on the new, updated system. It sounds phenomenal. The clarity of every possible detail when the band is playing is magical. It's a superb hard bop album. I've got a very clean copy which sounds as new. You could says it's a surreal feeling to put on this 50's original 1st pressing and having it sound as new. The jacket is also as new, just some beautiful patina giving away it's age. 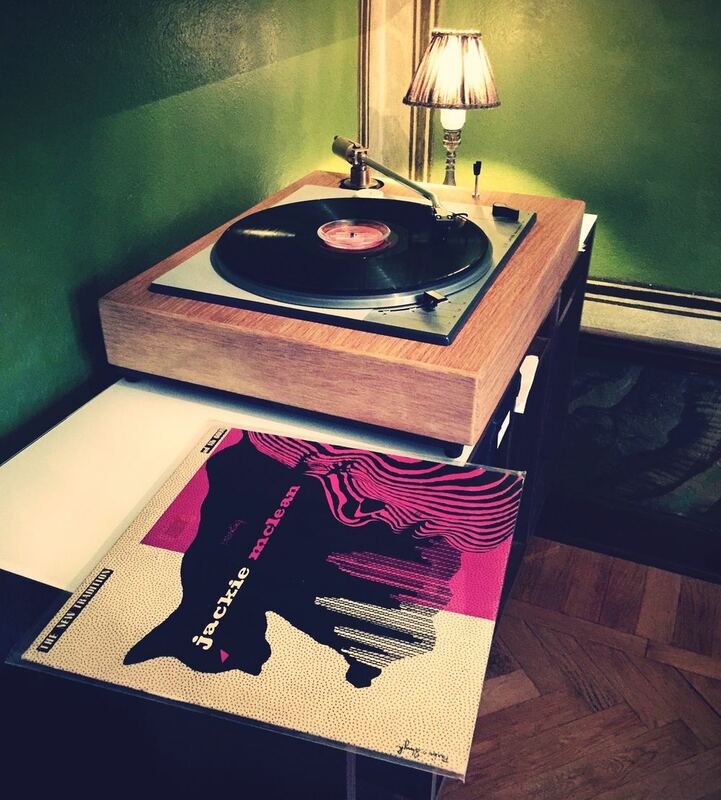 It's been a great moment to soak up some jazz on vinyl. Have a nice Sunday and stay tuned for more rare pieces. As cool as it gets. Just look at the cover, one of my absolute favorites. Chet Baker looks so young and untainted. The very first 10" that Pacific Jazz released. A classic line-up with Mulligan and Baker together with Bob Whitlock and Chico Hamilton. This album is truly a piece of jazz history. An important album, cause it represents the beginning of two great artists' careers. For me, especially Bakers as he is one of my all time favorites. This music is very special, it sounds like nothing else. Together, Mulligan and Baker created magic. They play off each other with such precision, ease and feeling. A cool version of jazz that sounds as fresh today as it did then. This album was recorded in 1952 and released in 1952 or 1953. It is therefore probably one of the earliest record I have. It's cool, it's smooth, it's melancholy, it sets an old-timey vibe. It makes you wanna sit there at The Haig in L.A. at a small table with a drink and a cigarette and just relax to this splendid, ground-breaking quartet that is truly one of a kind. The first tune "Bernie's Tune" lays the foundation to a superb little ten-incher. It's smooth, moody and sweet. I can just touch upon the feeling and reason why I listen to jazz and love it so much. The sound is warm and very pleasant when the LP continues with the tune "Walkin' Shoes", and it just continues this way, tune after tune. Great, calming cool jazz with a distinct originality. My favorite song on the whole album is got to be the beautiful ballad "Lullaby Of The Leaves" where Chet plays the way only he can. This is a wonderful album which is not that hard to get your hands on at a fair price. Many of the Pacific Jazz albums can be found at a reasonable price. Which is great news for once, but maybe these little 10" gems will rise in price as the years go by, so get them while you can. A top jazz piano trio album, perhaps my favorite to date. I started this morning with a dose of Art Pepper. Side 2 of Modern Art on Intro. A nice way to get this beautiful Saturday afternoon on track. A bit of interesting information; the alto intro on the tune "Stompin' at the Savoy" is a bit longer on this original 1st pressing than on other issues or formats I believe. Don't know about the Score issue. On other issues, it seems that the unaccompanied alto solo in the beginning of "Stompin'..." has been cut shorter. That's pretty cool, to think that you actually need the original pressing to get to hear that, as it was supposed to be. Just another reason to stick to 1st pressings. My relation to piano trios in jazz has grown very strong in the last couple of years. I truly dig that format, even though if I would choose one record to take with me to a desert island, it would probably have a horn or two on it. 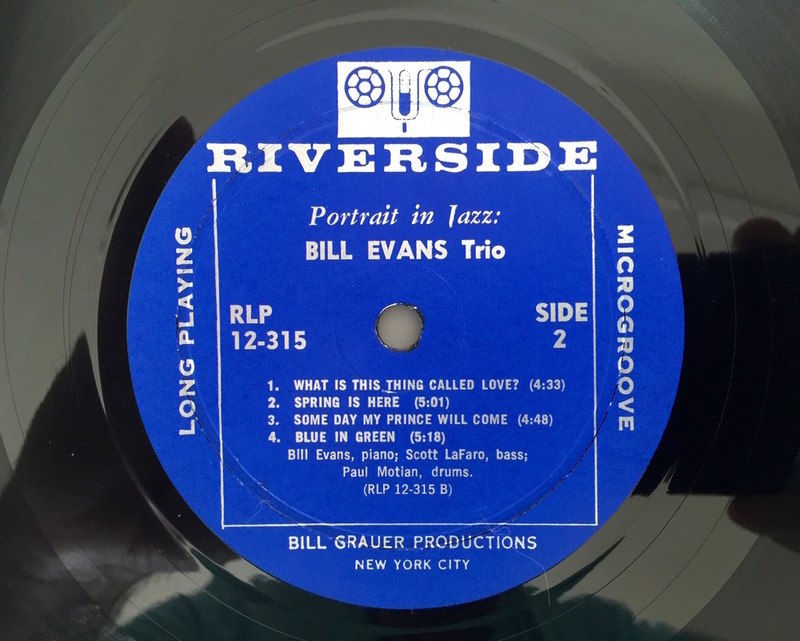 One of the best jazz piano trio albums I've heard to date is the one on display, Bill Evan's "Portrait in Jazz" on Riverside 315. It's a 1st pressing in nice shape. The cover is a bit worn but the vinyl is in M- condition. Sounds phenomenal. The drum sound for example is some of the best I've heard. Every detail is clear. You really need these kind of delicate, quieter albums to have the vinyl in top condition, so nothing distracts from the smooth tones of, in this case, the piano master Bill Evans. To be honest I haven't dug deep into his catalogue as of yet, but this album is a perfect way to start. I've listened to some other early stuff as well, and it's very good indeed. This is just the first of many Bill Evans records to find their way into my collection I would think. The rhythm section is one of the best I've heard with Scott LaFaro on double bass and Paul Motian on drums. They gel unbelievably well together and also gel and compliments Bill Evans with 100% feeling and accuracy. I would say, if you're just starting to appreciate jazz piano in trio form, then this is the album to pick up. It's so smooth and flowing, and with a superb sound mix. Jack Higgins was the engineer on this. What a great job he did, flawless. Right now, as I write this, I've just put on Side 2, and what a smokin' tune, it's "What is This Thing Called Love?". I really feel that I want to invest in some other piano trio albums. This LP just makes you forget about horns of all kinds. It's that good. I have a few on the list that comes to mind, for example Tommy Flanagan's "Overseas" on Prestige and the Sonny Clark Trio on Blue Note. 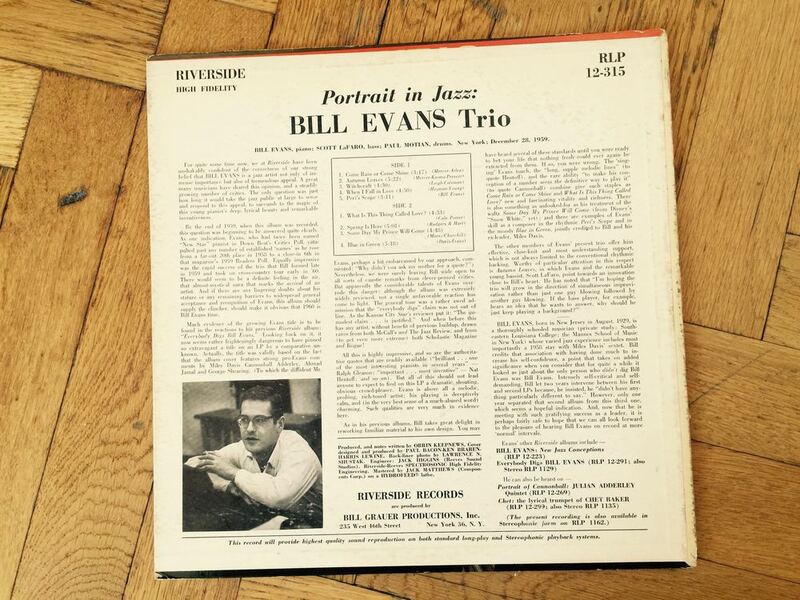 Also, some more early Bill Evans on Riverside is really appealing. I'll look forward to the autumn with great joy, cause I have some real gems waiting for me. I will soon be able to purchase the first one. It's a wonderful, rare album. Tune in for that. But I will put up some other stuff from the collection in the mean time. Stay cool in the shade, sip on a cold one and listen to some jazz. Enjoy your weekend. Cheers. One of the titles the small, charming Transition label put out. 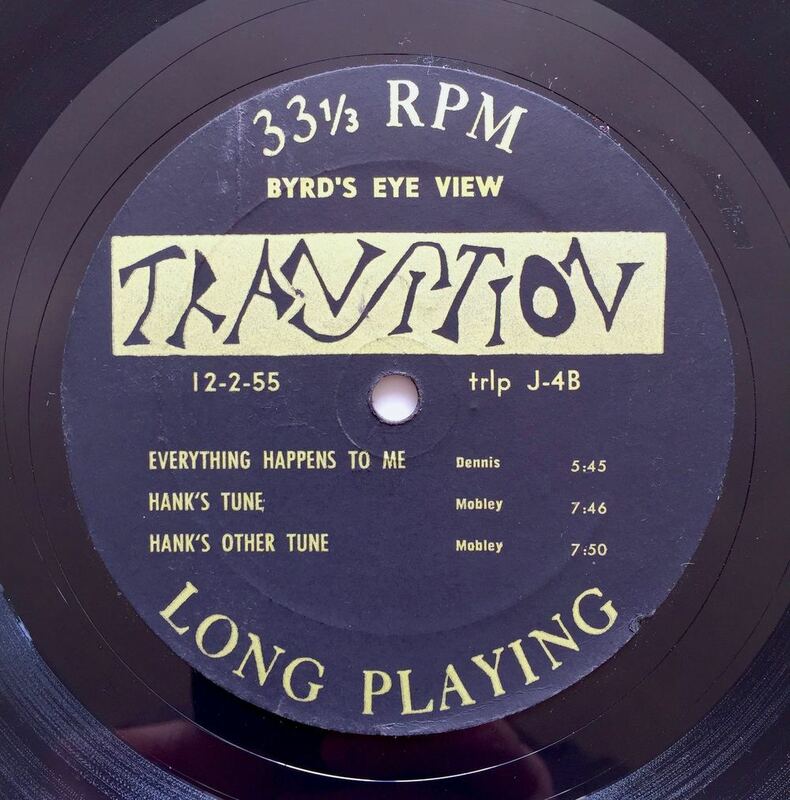 Here's a nice copy of Donald Byrd's early album "Byrd's Eye View" on the Transition label. It comes complete with the booklet. This is the only Transition record I have to date. I will aim for some other ones later as well. The problem though with these Transition records is that they are made of styrene instead of vinyl. This material is lighter than vinyl and supposedly wears out much quicker. This means I will play this record a bit less than the others I have, because I want it to be relatively fresh for a long time. I have it on the turntable as I write this, and it sounds quite good. It's been a while since I played it last. A great set of tunes played by a sextet consisting of Byrd and Joe Gordon on trumpets, Hank Mobley on tenor sax, Horace Silver on piano, Doug Watkins on bass and Art Blakey on the drums. The Transition label had the policy of recording with a "Live Concert Fidelity", meaning this; and I quote from the booklet... "We at Transition believe that the best jazz results from an optimum combination of musicianly skills and ethusiastic audience response. Each recording is made under the most authentic conditions: in the jazz club, at jazz concerts, or in the studio with a live audience in attendance. Few retakes are made, even at studio sessions, in order to preserve the freshness and spontaneity of the jazz improvisations"...pretty damn cool I'd say. This is for me, a must for any Donald Byrd fan. It's great example of his early work and a highly enjoyable session. The recorded sound isn't really comparable to the Blue Note albums of the same era, but this more primitive sound adds to the charm of the albums on this short-lived label. As well, the styrene compound maybe wasn't the best material for producing great sounding records. The labels on these styrene records are glued on and will eventually fall off. On my copy the labels are, amazingly, still attached. On one side the label has started to lift a bit but that's the way it goes. I'm happy with my copy of this very rare piece of jazz history. I'd like to get my hands on the highly desirable "Byrd Blows on Beacon Hill", also on Transition (17) at a later stage. I love these smaller jazz labels with rare records. The logotype of the Transition label is very cool, together with the special artwork of the front cover and the blank blue back. The booklet is a very nice feature as well, to make the package complete. To me, this record has to have the booklet with it. Amazing that my booklet is in such astonishing condition still, after all these years. If you come across this album don't hesitate to add it to your collection. It's a piece worth having for sure. Just don't play it too much... stay tuned for other great records from my beloved collection. The sun is shining here in Stockholm today, have a great Sunday! A special album by a special artist. Friday evening, at last. Sitting here and listening to side 2 of Art Pepper Meets The Rhythm Section on Contemporary. What an album. One of my absolute favorites and in my top 5 jazz albums of all time. A nice album to relax with after a long working week. Aiming to post another collectible this weekend, stay tuned. Enjoy your evening folks. My trusted, handbuilt modified Lenco. ... but I have only 3 months to enjoy it now, as we're moving apartments after the summer. But it's light, bright and crisp now. The ugly green paint is gone. Later, it will be fun to set it all up in the new apartment. But that's gonna take a while as we're renovating it all before we move in. Looking forward to the move and to put the first album on the turntable at the new place. The soundtrack to the last day of April. Just checking in. Spring is in the air here in Stockholm and today I got around to listening to one side of Sonny's Crib. Beautiful album. The copy I have is a nice 1st pressing and it's spinning as I write this. This is one of those truly great Blue Notes. I'm lucky to have a copy, especially the version with both sides NY23. Coltrane is present on this which makes it a tad more interesting than your average Blue Note. A great soundtrack for this day which is the last day of April as we're sliding into May with not too long to go until the summer begins and vacation time is here. We have booked a trip to California which I'm looking forward to tremendously. I have some awesome stuff lined up for purchase after the summer and through the autumn and winter. Stay tuned for that, but in the mean time I will post records from my collection for your viewing pleasure. Enjoy your day/night and be sure to listen to some jazz. Cheers! One of the best Blue Notes ever released. This is one of the very best Blue Notes if you ask me, and one of the rarest. 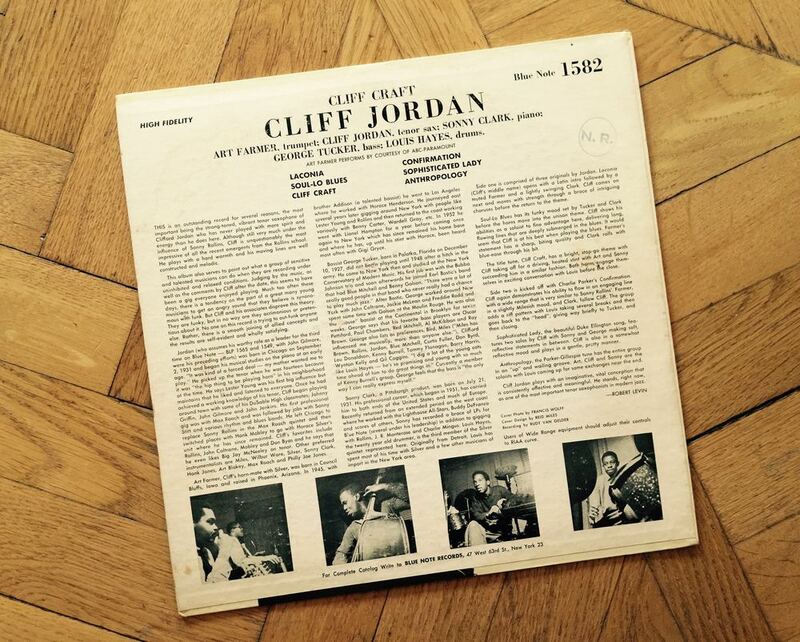 It's a superb flowing effort by Cliff Jordan, playing together here with the brilliant Art Farmer (trumpet), Sonny Clark (piano), George Tucker (bass) and Louis Hayes (drums). This is one of those truly sweet jazz pralines that the Blue Note 1500 series has to offer. The 1500 series is special. For me, it's the definite jazz go-to series. So many superb albums. The sound is very nice on the ones I have, so tasteful, organic, vibrant and full of soul. 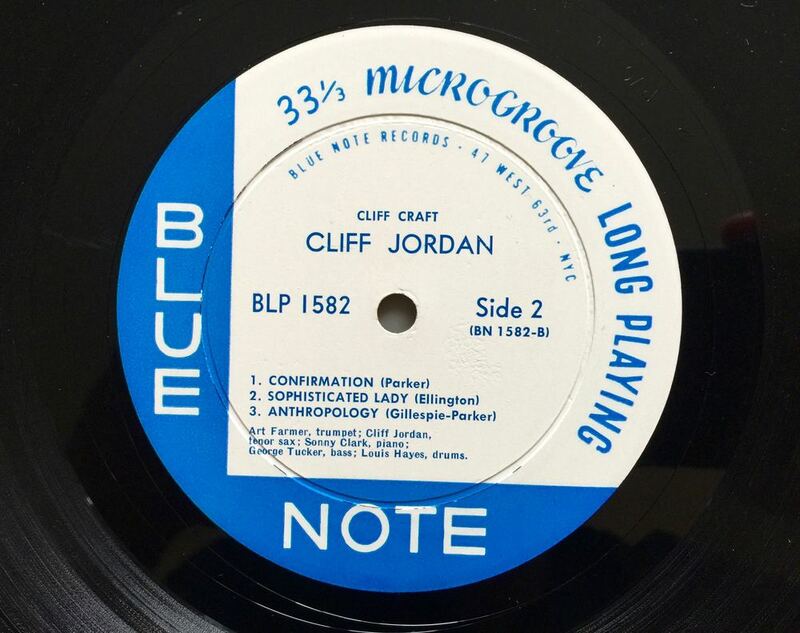 "Cliff Craft" starts off with one of Cliff Jordan's own compositions "Laconia", and once the first few notes have made their way from the speakers to your ears you know this album is going to be something special. This music is smooth, relaxing and it makes you forget your troubles in a jiffy. This is my kind of jazz. I'm highly impressed by the craftmanship of Jordan on this one. After that superb first tune it's time for another Jordan original. A bluesy, very enjoyable tune called "Soul-Lo Blues". I really appreciate this kind of jazz tune that contains a good portion of bluesy aspects. This Jordan guy can sure write some good stuff. I dig him a lot. Have really just started to explore his albums. This album is an extremely good example of his work for anyone looking to get into his music. I'm listening to my original 1st pressing as I write this. Very nice copy. The tune is coming to an end now. Soon, the title track, also a Jordan original will start. Ok, now it's on it's way... Fast tempo stuff here. Classic harb-bop. The tenor sound of Cliff Jordan is full and rich. He plays really well. Already up there with my favorites. The rhythm section is superb. Side 1 = very, very good stuff. Now for Side 2, which holds three standards. Ah, Bird... you hear it straight away. "Confirmation" is the tune and it's wonderful. A medium-tempo effort which really speaks to me. Jordan plays superbly. Art Farmer then comes in with a relaxed solo. He has a sweet tone. Very laid back. The Blue Notes he plays on are all worth trying to get. 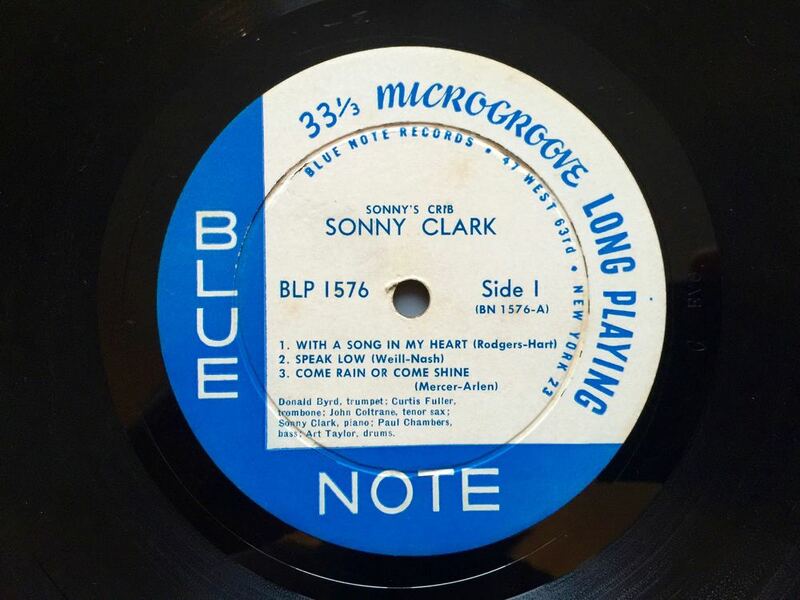 Sonny Clark is a favorite and his solo on this is smooth and flowing. Of course, his stuff on Blue Note is highly regarded among collectors for a good reason and I'm aiming to try and get it all. I'm quite keen on the Trio album with Paul Chambers and Philly Joe Jones on Blue Note 1579. The theme rounds off the song and I love it. Next up is the ballad "Sophisticated Lady" composed by Duke Ellington in the early 1930's. A beautiful tune which is already among my favorite slow ones. This extremely nice album concludes with Parker and Gillespie's classic composition "Anthropology". Doesn't get much better than this folks. A very nice theme. A driving tune which leaves you wanting more. Such a great sign off to this album. If you haven't got it, you should buy it right now. Today. For me, one of the best Blue Note records ever made. It's a grey and dull day here in Stockholm, but listening to this masterpiece sure lightened things up a bit. Have a great rest of the weekend and stay tuned for more jazz history. Chet and his Crew will take you on a cool, smooth ride. 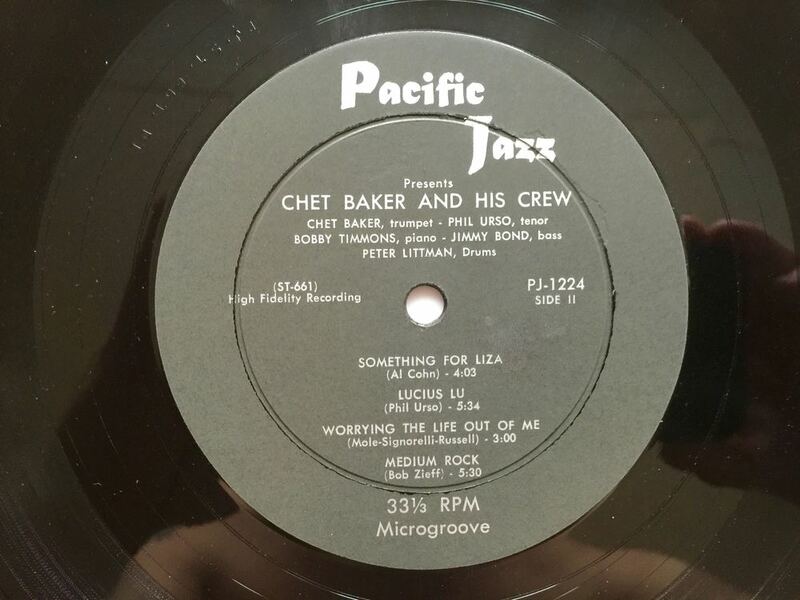 Here's a classic Chet Baker album on the Pacific Jazz label. 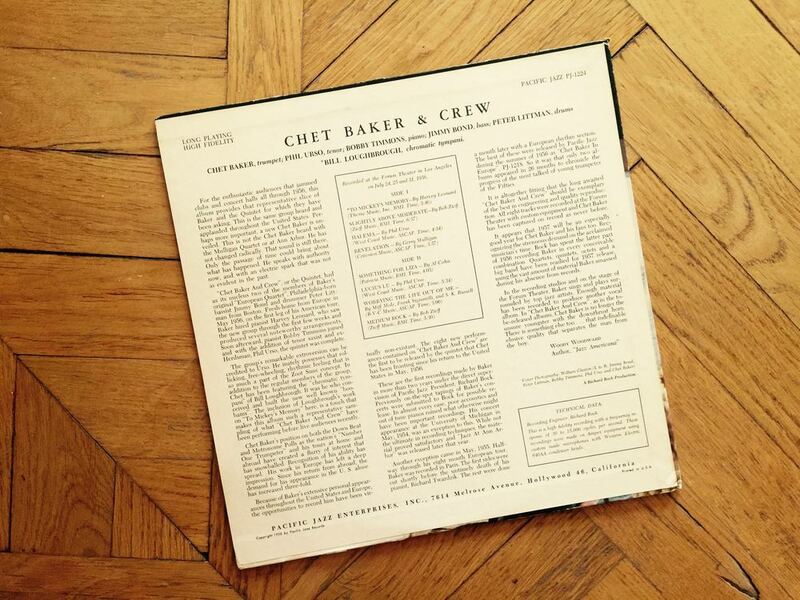 It's a highly enjoyable album, with Chet in excellent form. He plays cool as usual. You put this on, and dream away to sunny California in the 1950's. Maybe relaxing on a boat like the one with the Crew on the front cover. I truly dig these early Chet albums. He's got a clearer more urgent sound than in his later days. I appreciate his whole career and output though, even his later stuff on small European labels when he was down and out. I dig Phil Urso on tenor sax. He's got a really nice sound. I had totally forgotten that Bobby Timmons (piano) was on this. I love his playing. He's on some other very nice albums that I have. This album's got a nice feel to it which is great to experience again since it's been quite a long time since I listened to it last. There are a lot of nice tunes. Overall, I think I prefer Side 2. I think this album is quite rare. I haven't seen a bunch of copies each year from what I can remember. You should definitely check it out if you're unfamiliar with it. For any Chet fan it's essential. Have you got any opinion on this album? Please, share. I actually got some sweet minutes of listening this weekend which was very nice. I listened to this Chet gem and also an exciting, newly purchased Blue Note rarity which I will post here on the site in due time. Next week it's Easter and I will have a few days off. Then I will try and get some more listening done. Have a wonderful day/night and stay tuned for more hot/cool jazz vinyl. What an absolute pleasure it is to be able to put this record on the turntable. An outstanding original 1st pressing in beautiful condition. It's a dream to own this. I thought I'd have a listen to this baby on this grey friday afternoon while my son is sleeping. This is one of my favorite albums for sure. I always get positive vibes from the tunes on this rarest of jazz collectibles. The tunes are nice and have a very laid back feeling to them even on the faster ones. Just wanted to check in with one of these posts where I write about some moment where I put a record on the turntable or something else in the daily life. But back to the beauty that is playing on the turntable as I write this. The sound is stunning on this. It plays like new, with zero noise. Clean, crisp and smooth sound. I'm very grateful that I was able to purchase this album, cause when I follow the market there hasn't been one single copy available in this condition since then. Jackie McLean has a sound of his own, that's for sure. He always plays with a lot of lyricism and smoothness. It's a silky, pleasant sound. The pianist Mal Waldron is a cat that I really like as well, and I need to check him out more. The drummer Ronald Tucker I haven't heard much from or about. He plays very laid back, very unintrusive. he just flows with the music. Simple drummer, with a simple sound that fits perfectly with the make-up of the tunes here. "Lover Man" is the last tune on which McLean plays great and a nice ending to a sweet, rare album. It's a record which I will treasure forever. Currently saving up a war chest for buying some albums. You will see which ones I end up buying here on the site. Stay tuned. Have a great Friday and weekend. Have a drink, listen to some jazz and relax. That's my plan anyway. Cheers! A classic Miles album, a pleasurable experience. The Miles classics on Prestige were among the first records I acquired 1st pressings of. I don't have them all, just a few. 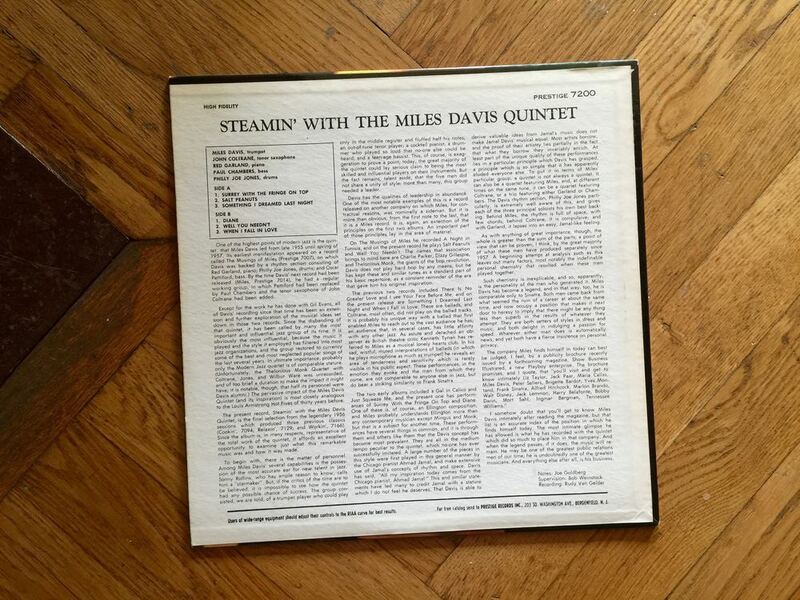 It was quite some time ago I listened to them, especially the featured album "Steamin' With The Miles Davis Quintet". It's a very nice album, and I really should listen to these Miles albums more, cause it's truly beautiful music. The copy I have is in superb condition and it sounds accordingly. It's actually one of the few albums I've bought in a real physical record store. I got a very nice price on it and the condition was perfect. Listening as I write to the first side of the album. A very good mix of tunes here, with the laid back opening track "Surrey With The Fringe On Top" paving the way for a medium-tempo, relaxing few minutes, and then that half-sleepy, sweet moment is shattered with a great, high energy take on Dizzy's classic "Salt Peanuts". Then a wonderful, brushy ballad appears named "Something I Dreamed Last Night", on which Miles plays beautifully. A highly satisfying and complete Side 1. Now, let's flip the disc. First tune, "Diane", it's unmistakable Miles. His tight, yet lush muted trumpet work is a pleasure to experience, especially when my system makes it feel like he's in the room with me. Coltrane then comes in and takes a solo which only he can. A perfect start to Side 2. Next tune is Monk's standard "Well, You Needn't", a nice tune, which is highlighted by Miles' unmuted trumpet playing, no point in denying it, while muted trumpet is quite nice sometimes, the unmuted instrument is more appealing to me. But if someone can make a muted trumpet sound absolutely beautiful and interesting, it's the leader of this album. And, the last tune "When I Fall In Love" is a testament to that, another sweet ballad with the trumpet muted. It's all good, cause it's Miles Davis. I'll try and post more frequently, but I've found free time hard to come by in the last few months. I'm currently in the process of saving up a sizeable budget to buy more albums. I've already acquired an original copy of "True Blue" earlier this year, so the 2016 collecting year went off with a bang. Now it's time to get to work on getting some other nice stuff as soon as possible. Have a nice Sunday, stay tuned for more great LP's from my personal collection and I'll concentrate on getting over the cold I've been stuck with for over a week. The soundtrack to a lazy afternoon. My son took an afternoon nap today, so I decided to seize the moment and listen to some jazz vinyl. I flipped through the collection, and in the end picked Sonny Rollins - The Sound of Sonny on Riverside. I haven't listened to this in a while, and boy is it good. My original 1st pressing sounds absolutely superb. It's quite a relaxing album. I only listened to Side 1, and I enjoyed it very much. A great choice for a lazy Sunday afternoon. I love Sonny Rollins, and he is one of the main reasons I started listening to jazz for real. I have some very nice albums with him, but there's an ocean of stuff I'm missing still. I need to try and secure some more great Rollins LP's soon. It's just that those albums need to become available at the right time, when the funds are there. Also, there are so many albums that I want, I don't always go for a particular artist next, it's more like; I check what's available and go with something I can't resist at that moment. Anyway, a new Rollins album will surely be high on the wishlist after being reminded once more, that he's one of the very best. Splendid album here with the highly underrated tenor saxophonist Tina Brooks. This is, I guess, considered a "holy grail". Which to me means it has to be musical-wise outstanding, very rare, highly priced and very sought after. This record has all of those attributes. All the tunes are a pleasure to listen to, and the album has a good mix of tunes which makes it interesting. An absolutely outstanding ensemble work their magic on this, and they consist of Tina Brooks on tenor sax, Freddie Hubbard on trumpet, Duke Jordan on piano, Sam Jones on double bass and Art Taylor on drums. Very difficult to pick favorite tunes, as they are all so good, but my picks for the moment are "Good Old Soul" and "Nothing Ever Changes My Love For You". 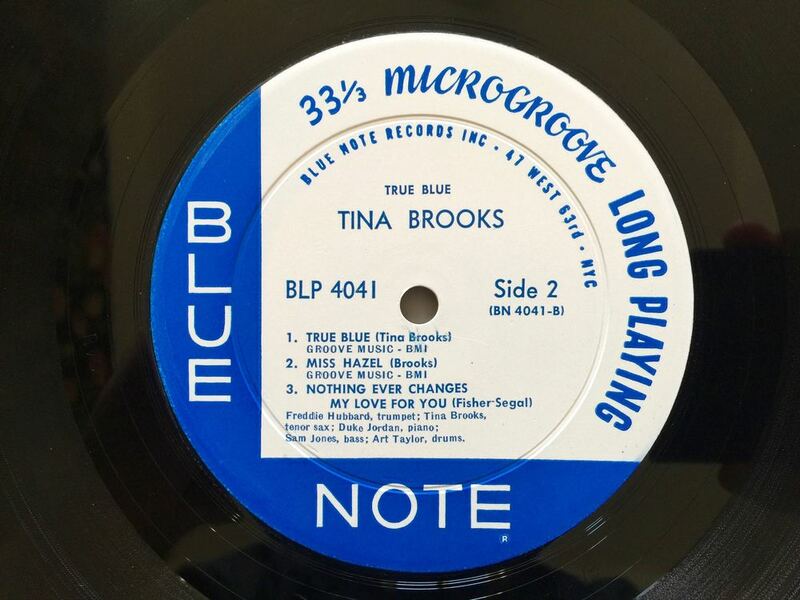 Tina Brooks was a very gifted musician who made a few very nice recordings during a far too brief career, which was cut short by heroin dependency, gradually deteriorating health and ultimately death, caused by liver failure at age 42. I'm just starting to get into this magnificent artists work, and "True Blue" is a nice way to start. Freddie Hubbard is another artist which I'm really getting into at the moment, though I have listened to him before. But now, I hold him in very high regard and I'm planning to buy a lot more stuff with him. What a trumpeter. A virtuoso. Clean, brilliant sound and a lot of amazing technical abilities. The other cats are top notch as well. There are a lot of albums in the early Blue Note 4000 series which are very, very good and superbly recorded. The sound quality is outstanding. The copy I have is very nice, with a VG++ cover and a NM record. It's the first catch of 2016, and a pretty sweet way to start another year full of collecting rare jazz vinyl. I'm extremely happy to have been able to add this masterpiece to the collection. I'm aiming to secure some more pieces from the 4000 series very soon. If you have the chance to buy an original pressing of this baby, don't hesitate for one second. It'll be worth every penny spent and a joy to slide off the shelf and put on the turntable and listen to. If you don't have it and if you're not able to purchase a 1st pressing, buy another version as soon as possible. This album should be on the shelf of every jazz lover. It's cold and frosty here in Stockholm tonight, about -10°C. But the warmth of playing a few jazz tunes and looking at the collection makes it quite cozy. I'll be back soon with another post, so stay tuned and have a good day/night. Cheers! Enjoying a day off by myself listening to jazz. Sitting here on a day off listening to Thad Jones the Magnificent on Blue Note 1527. Smooth, laid back jazz. A great album. It's a privilege to have all these rare 1st pressings to put on the turntable whenever I like. The wife and kids are visiting some relatives, so I'm completely free to stroll around the apartment or sitting on the couch, listening to jazz all day. It's not easy to find time to actually sit down and listen for hours to the LP's I have when you have a family around you. I don't have a separate room yet either where I keep the turntable and records. I will have one eventually, and it will become easier then. When the kids get a bit older it will be easier as well. I think I will listen more and more to the records as the years go by. I will find more time to do so. So, at this moment I'm just enjoying myself, to be alone and just listen for some hours. Quiet downtime, brilliant. Next up: The Return of Art Pepper on Jazz:West 10. I have been to vacation to Jamaica over the holidays and haven't posted during that period. It was a wonderful vacation with the family. Got some much needed sun and warmth. Recharging the batteries. Anyone wanting a relaxing, sun & ocean vacation should go there. The heart of the Caribbean. We went to Negril's Seven Mile Beach (south part) which had a very laid back vibe. Highly recommended. The 2nd of January was the 1 year anniversary of this version of the site. During this time I've been posting many great gems from my collection. I will continue to do so for many, many years. It will be interesting to see what excitement this year brings. I've already bought and secured the first top rarity of 2016, just yesterday. It will arrive in a few days I believe. I will probably post that one quite soon. And if I decide to wait a bit to post it, another superb album will come up here instead. I'm very happy to have been able to secure that one, it's truly one of the hottest items on the vintage jazz vinyl collectors market. Can't wait to put it on the turntable and sliding it onto the shelf together with the other Blue Notes, for yes, it's a Blue Note. I thought that I would start posting these kind of little update/current reflections posts in between the album posts, just to mix it up a bit. So you guys can get something else out of the site as well. I will be back with a nice rarity soon. Stay tuned! An enjoyable, smooth old Savoy. 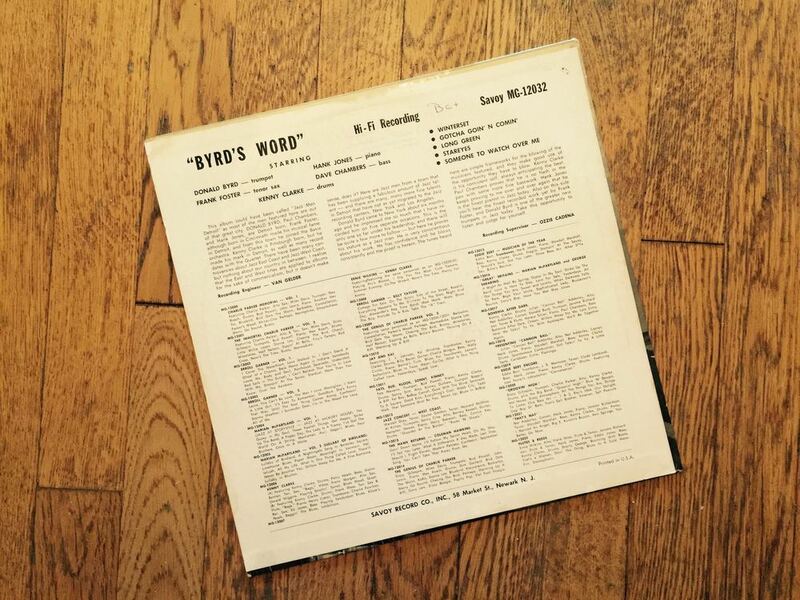 Great, early Donald Byrd LP on the Savoy label. Very nice tunes and ensemble consisting of Byrd on trumpet, Frank Foster on tenor sax, Hank Jones on piano, Paul Chambers (oddly credited as Dave Chambers) on bass and Kenny Clarke on drums. A little too much reverb in some parts on the horns, but a very enjoyable session. I tend to like a more dry sound than what you have on this particular LP. But it's still a great soundin' album. Superb creamy and black cover as well with a young Donald Byrd and Paul Chambers on there. I have far too few Savoy's in the collection to date. I will look into getting some more. One for example, that is quite desirable to me is "Introducing Lee Morgan" which I will try and acquire. For many reasons I really dig these old Savoy LP's a lot. A cool, classic label. The ones I've heard are great music-wise, not over-the-top expensive, in other words a solid investment. Do any of you guys have any old Savoy favorites? Favorite tune on the featured LP is probably "Long Green", the first track on Side 2. This album is smooth, loose and perfect to put on the turntable on a dark, cold and damp December afternoon like this. Donald Byrd is not my favorite trumpeter, but he always delivers an enjoyable experience, like on this effort. I would recommend this album to anyone. It's smooth hard bop with some cool cats and you can't go wrong with that. Next year promises some exciting stuff, for example in the end of January, when I will purchase a great, rare album. A "holy grail" if you like. Looking forward to that. I have some other nice stuff lined up as well, so I'm starting off 2016 in high gear. As I write this it's 4 P.M. here in Stockholm and it's pitch black outside. I will go on a family vacation on Wednesday to Jamaica. That will provide some much needed light, warmth and sunshine. I'm thrilled to be going there. Can't wait to sip on a cool one on the beach and take a dip in the Caribbean Sea. I won't be back until New Year's Eve. If I don't post while on vacation I would like to wish all my readers a Merry Christmas and a Happy New Year! Also, have a nice weekend and please, leave a comment if you like. 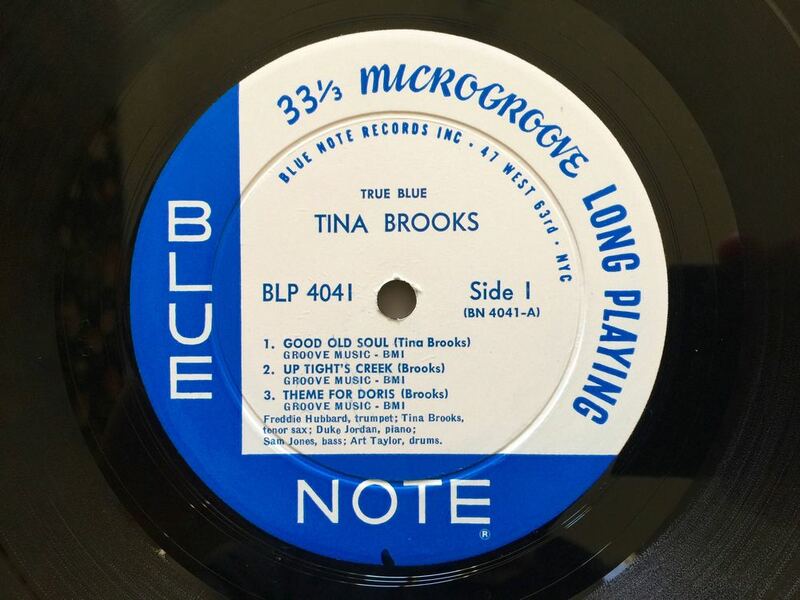 A classic, original Blue Note feat. Coltrane. This LP was recorded in 1957 and released in 1958. What a fantastic record. To have this original, vintage jazz 1st pressing in my collection is a great pleasure. Especially as it's a true 1st pressing with the NY23 label on both sides. The vinyl sounds great. The jacket has some stains and an old sticker with a previous owners name and address, but that doesn't bother me too much. It's part of the charm. To know that this was once owned by someone from Georgia is quite cool, and it makes the mind wander a bit. That this piece has found it's way to my collection through the years, from at least one confirmed place, the deep south. I'm very happy to have been able to add this masterpiece to the collection in it's original form. It seems like a 1st pressing of this title is quite hard to find, you almost never see it with the NY23 on both sides. How many copies have you seen with the NY23 on both sides in the last 5 years? Only a handful I suspect. The presence of John Coltrane makes this a rare Blue Note in itself. He was only present on a few Blue Note records. The tunes are all top notch. Superbly executed. My favorites being maybe the opening track "With A Song In My Heart" and "Speak Low". A great, classic LP from Blue Note's golden era. The personnel are: Donald Byrd on trumpet, Curtis Fuller on trombone, John Coltrane on tenor sax, Sonny Clark on piano, Paul Chambers on bass and Art Taylor on drums. I really dig Curtis Fuller's contribution on this LP. I have a few records on which he is present as a sideman, but I should really check out his sessions as a leader more in depth. There's a few on Blue Note which are quite desirable. He is great on all the recordings I have with him. As you'd expect, Coltrane is smokin' on this recording. I still prefer his earlier work over the later stuff. I'm getting more and more into the later stuff though. But at heart, I think I will always be a 50's hard bop fan, with Coltrane playing beautiful and fiery. Donald Byrd is a player which I enjoy. He always delivers a smooth, swinging touch to any record. Maybe not a superb virtuoso, like Dizzy Gillespie, Fats Navarro, Clifford Brown, Lee Morgan or Freddie Hubbard, but a reliable trumpeter with great qualities and is featured on so many outstanding recordings. 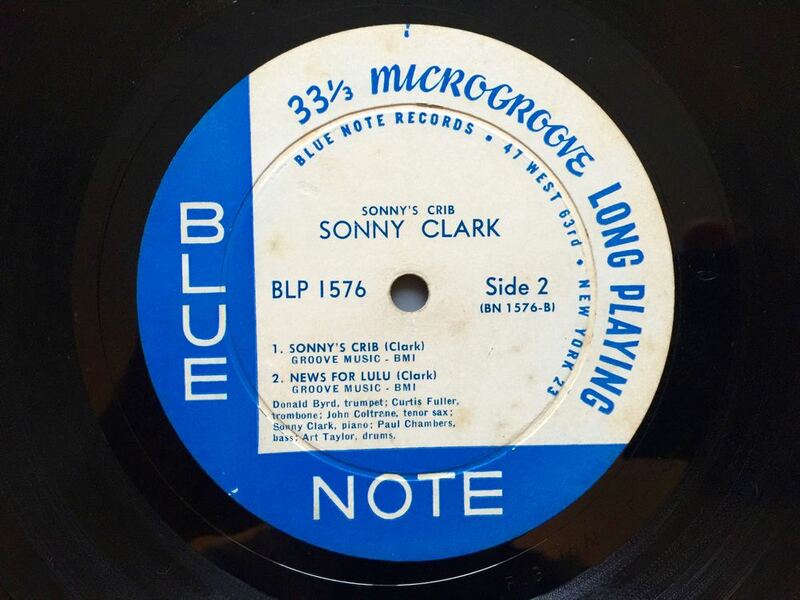 Sonny Clark is of course a great pianist. I enjoy his stuff and the amount of extremely desirable recordings he's on is second to none. I'm getting more and more into the piano as a instrument in jazz. I truly enjoy piano trios for example. I'm still more into the different horns and the drums in jazz but the piano is getting quite a bit more interesting and important to me with every year that passes. I'm delving into Bill Evans work. I've touched a little early Monk as well. Sonny's Crib is a great addition to any jazz collection, and to have an original 1st pressing, NY23 both labels copy is a blessing. If you haven't checked this LP out before, now's the time. It's a joy to put this on the turntable. In the end of January I will buy a superb, highly desirable, very rare LP. I'm looking forward to that one. I will post it here as soon as I've listened through it. Stay tuned for that. In the mean time I will post some nice records from my collection. Enjoy the images, and be sure to click on "Post History" in the top menu, to browse through older posts with a lot of great records from my collection, if you have missed those. Have a great Sunday!